The Baby Relax Coco Chair and a Half Glider is crafted with a roomy, oversized design that is tailor-made for nursing mothers. With a deep seat and a wide profile, this sleek design offers an inviting welcome with gently padded track arms and a pillow back that gives you so much more than a traditional glider. The ample room and support gives nursing mothers an advantage to feed, sooth and bond with their child in unrivaled comfort. Featuring a solid wood base that provides a smooth gliding motion on any surface, the Coco is upholstered in an elegant easy-to-clean gray linen-look fabric that contrasts beautifully with the exposed wooden base. For a complete seating experience, pair with the Baby Relax Coco Gliding Ottoman and revel in your invitingly peaceful nursery. Transform any corner of your nursery into the ultimate escape with this Tufted Gliding Ottoman from Delta Children. Designed with foam padding and a smooth rocking motion, it allows you to rest your feet comfortably while helping tired babies drift off to sleep. 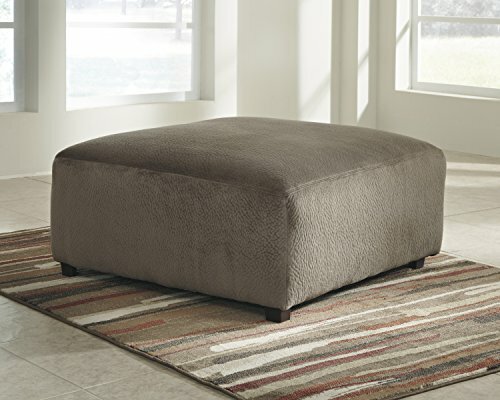 Featuring clean lines, a square tufted pattern and plush microfiber upholstery, this stylish ottoman can easily transition from the nursery to any room in your home. 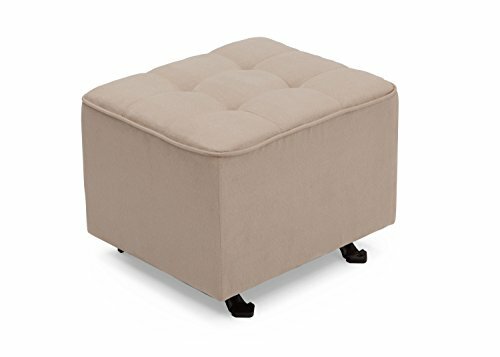 The Tufted Nursery Gliding Ottoman perfectly coordinates with a number of gliders from Delta Children in the same microfiber upholstery (sold separately). Delta Children was founded around the idea of making safe, high-quality children's furniture affordable for all families. They know there's nothing more important than safety when it comes your child's space. That's why all Delta Children products are built with long-lasing materials to ensure they stand up to years of jumping and playing. Plus, they are rigorously tested to meet or exceed all industry safety standards. A comfy partner to the Baby Relax Coco Chair and a Half Glider and a beautifully tailored addition to your nursery, the Baby Relax Coco Gliding Ottoman not only pulls the look together but will add style and depth to your nursery. This ottoman keeps perfect pace with its glider partner and both transition seamlessly out of the nursery when the time is right. With a smooth gliding motion, the Coco Gliding Ottoman provides the right height to place your feet up during nursing, or gently glide your little one to sleep. It comes upholstered in an easy-to-clean gray linen-look fabric and has an attractive welted border on the surface. Designed for the modern nursery, the Baby Relax Coco Gliding Ottoman is great on its own or combine it with the Baby Relax Coco Chair and a Half Glider for the best seating experience for you and your child. The STASH Folding Kids Sofa Chair is soon to be your child's favorite chair. Lift the seat to reveal a hidden, built-in internal storage compartment that's the perfect place to store toys. 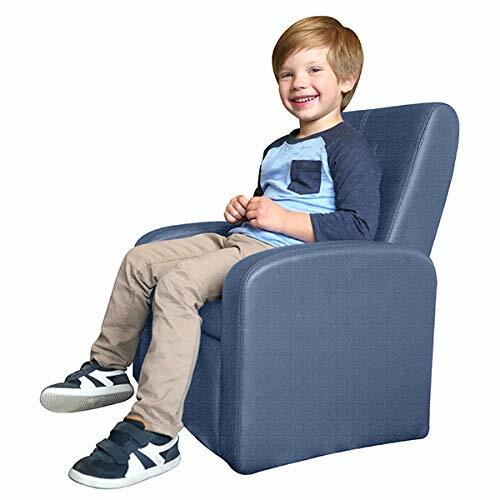 The back folds down converting the comfortable children's' sofa chair into a fun ottoman that's great for sitting, propping your feet up and can be the launchpad for your child's next adventure. STASH is a small upholstered (fabric) chair with a sleek modern design that fits the decor of most rooms. It's the perfect playroom chair - giving your child a space they can call their own as they sit, lounge, nap, play and store their toys all in this modern sofa chair. STASH is a plush, comfortable kid's lounge chair with a sleek modern design that fits the d cor of any living room. Place STASH in your child's bedroom for a fun reading chair. STASH is a cute, comfy and unique modern sofa chair that gives kids & toddlers a fun place to sit in any room. Yes, adults can sit on STASH too! This mini upholstered chair isn't just for kids - most adults can sit comfortably either in the small folding chair or on the ottoman for a convenient seat when playing with your kids. STASH Folding Kids Chair Dimensions: 21 lbs Back Folded: 20x16x14.5" Back Raised: 20x16x25" Storage Chest: 7.5x13x14.5" Material: Fabric About UNCAGED FURNITURE: We believe your home furniture should do more and are on a mission to design modern furniture with a focus on modular, multi-functional home furniture designs. The STASH Folding Kids Sofa Chair is our first product - a fun kid's sofa chair. It's the perfect folding children's chair that even adults can use. We think this kids sofa chair is awesome and hope you'll love using this fun children's chair as much as we did creating it! KIDS LOVE IT! Give your child a chair that they'll love and will make their own. The folding STASH children's chair with storage lets your child sit, nap and play in comfort. 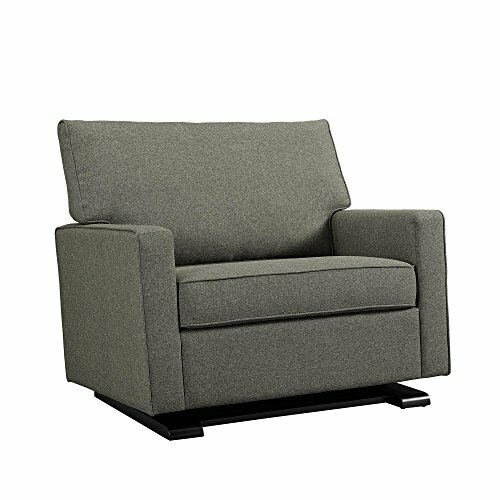 COMFY FOLDING KIDS SOFA CHAIR: comfortable upholstered children's lounge chair that folds into an ottoman. Easily collapse the back into a sleek cube for playing, sitting, and lounging. 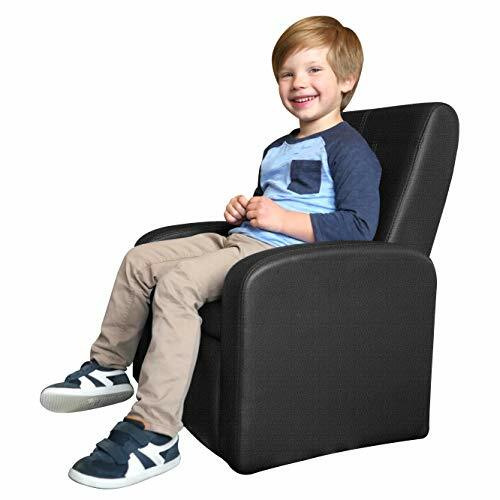 MODERN KIDS STORAGE CHAIR OTTOMAN: lift the seat to reveal a hidden storage chest that's easy to access, spacious and the perfect place for storing toys. De-clutter and organize with this multi-functional playroom chair. 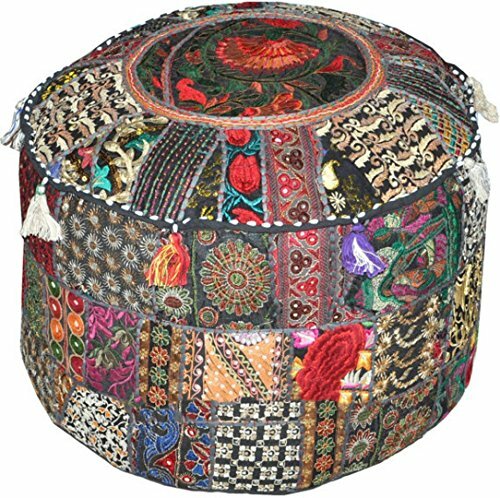 Vibrant and colorful handmade "Patchwork" ottoman pouf cover from Rajas than, India! Incorporates sophisticated patchwork in many shades of vibrant color made from many exquisite and carefully chosen.Note:-As this is Applique Hand patchwork, There will be variation in patches. Base Color will Be same. These are authentic styles Beautiful cushion studded with Heavy Embroidery, In this cover Vintage patches from old, valuable wedding saris & dresses are patched and stitched together at random to create a collage like effect and decorated with all kinds of colored , threads, patchwork, raised colored thread work and embroidery in intricate designs with beautiful tassel work. These are beautiful handmade cushion/pillow cover with rich embroidery and exotic jewel colors. 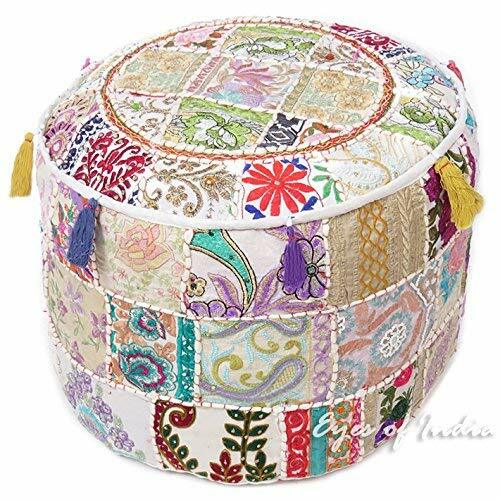 Beautiful "Khambadiya" floor pillow made by hand by artisans in Barmer, India from carefully chosen and sown together patches from vintage saris, lenghas and wedding dresses. Witness the exquisite embroidery and thread work on a vibrant cotton backing, creating a stunning collage bursting with gorgeous patterns and colors! NOTE:-This is to clarify this product is under the label of Brand Name BHAGYODAY FASHIONS in the prime quality of 100% cotton fabric thread count 20x20/ 52x52.We are not liable for any of the seller Packing sell to this product with any other brand name Sending a product without the label of brand name BHAGYODAYFASHIONS. We had not given authorization to any of the seller to sell this product without label BHAGYODAYFASHIONS. 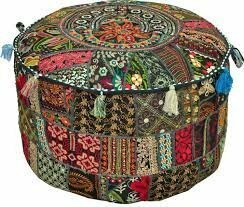 Traditional India Indian Patchwork Pouf Cover Indian Living Room Pouf, Decorative Ottoman,Embroidered Designer Ottoman, Home Living Footstool Chair Cover, Bohemian Ottoman Pouf Decor 14x22 Inch. 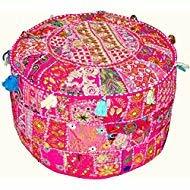 Vibrant and colorful handmade "Khambadiya" ottoman pouf cover from Rajasthan, India! Incorporates sophisticated patchwork in many shades of vibrant color made from many exquisite and carefully chosen and arranged cuttings from saris, lehngas and wedding dresses. ***CUSHION COVER ONLY. INSERT SOLD SEPARATELY*** Search "Eyes of India Insert" to buy inserts for our pillow covers. Size: 24 in. (60 cm) diameter; Hidden zipper enclosure on back. These colorful decorative accent pieces are embroidered by artisans using the Ari technique. Our round cushions and boho pillows are made with superior quality, impressive durability and for long-lasting use. 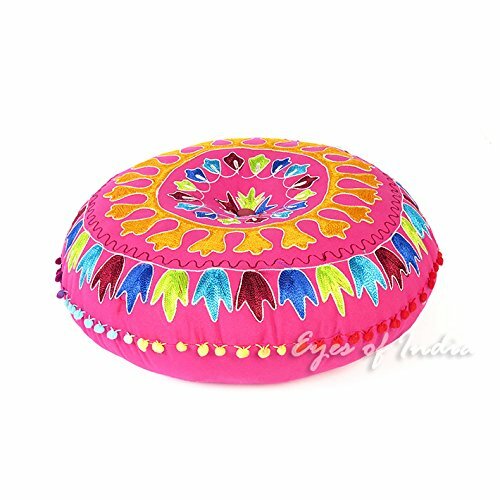 Our multi colored large round pillows have a pompom tassel border and bring a boho chic look to any bedroom, living room, foyer, TV room, office, guest room or yoga meditation room. Unique gift idea. Eyes of India Guarantee: Shop with confidence. Over 10 years' experience. Our products come with a 60-day easy return policy and 100% satisfaction guarantee. The Baby Relax Hadley Storage Ottoman for Baby Gliders is the answer, For a practical storage solution for your nursery or child's playroom. The ample storage space will hide toys, books, blankets, and more. 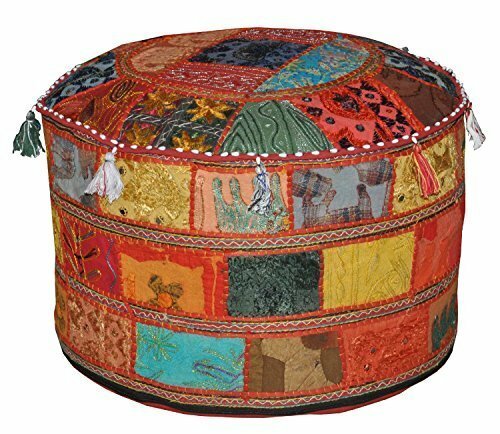 Opening and closing the ottoman lid is easy and safe thanks to its dual-hinged top,. 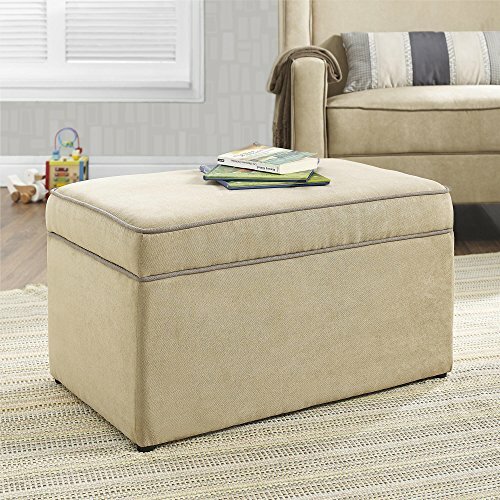 The Baby Relax Hadley Storage Ottoman for Baby Gliders is available in two soft Microfiber fabric options. The complementing two toned welting gives the piece a polished look and matches The Baby Relax Hadley Double Rocker perfectly (double rocker sold separately). .Note:- As this is Applique Hand patchwork, There will be variation in patches. Base Color will Be same.
! About size: All dimensions are measured by hand, there may be 2-3cm deviations. Please ignore the tag size comes with the cloth. The tag size sometimes can be a larger than our description size because those are for Chinese. We are 1 or 2 sizes smaller than European and American people. 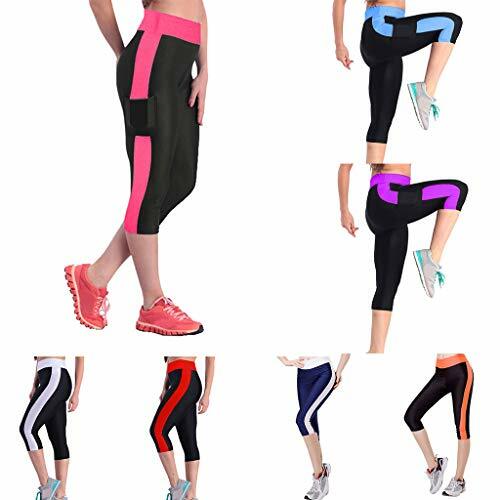 Size chart Size:S Waist:61cm/24.05'' Hips:80cm/31.49'' Length:70cm/27.55'' Size:M Waist:62cm/24.4'' Hips:81cm/31.88'' Length:71cm/27.95'' Size:L Waist:65cm/25.59'' Hips:84cm/33.07" Length:72cm/28.34'' Size:XL Waist:66cm/25.98'' Hips:85cm/33.46'' Length:73cm/28.74'' Size:XXL Waist:70cm/27.55'' Hips:97cm/38.18'' Length:75cm/29.52'' Size:XXXL Waist:72cm/28.34'' Hips:98cm/38.58'' Length:76cm/29.92'' ! Attention Please: For transportation needs, the dress that you've received will have a fold phenomenon. Please don't worry, this fold situation will disappear after the first time you clear or ironing. ! About color: Pictures are only samples for reference. Due to limitations in photography and the inevitable differences in monitor settings, the colors shown in the photograph may not correspond 100% to those in the items themselves. Welcome to our store Tootu, if you have any questions about our products when you recieve the products, please feel free contact me,we will solve your questions within 24 hours . If you don't know how to choose the size, please refer to the size table in our description or Picture . If you are between two sizes, we recommend the larger size. 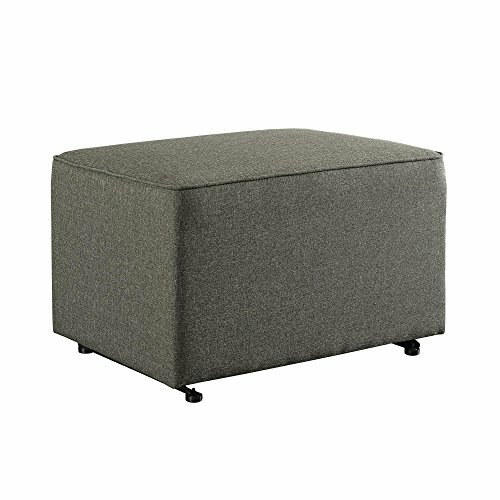 Putting the fun in functional, the Tornio Oversized Accent Ottoman just looks like a comfy place to plop down and get comfortable-and it sure is. Wrapped in a buttery soft, high-nap microfiber, it's not only a feast for the senses, but also a practical piece of furniture to have around, especially for informal get-togethers. Top it with a tray and put it to use as a table, whatever makes you comfortable.